The Soho Bandana collection by Amy Barickman of Indygo Junction features iconic bandana squares in red and green and seven carefree coordinates in red, green, and navy. The eleven-inch bandana squares are printed three across the width of the fabric, so there's plenty of room for seam allowances for machine piecing, home décor projects, and hand appliqué. 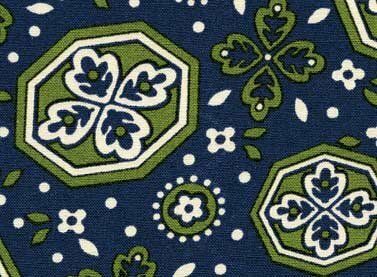 Coordinates include a medallion toss, cheerful dots, a small paisley, leafy sprigs, and three wonderful stripes that run the length of the fabric. The wide stripe is perfect for quilt borders, tablecloths and runners, skirts, and tunics. The medium stripe is great for shirt yokes and plackets, and bands on purses and totes. 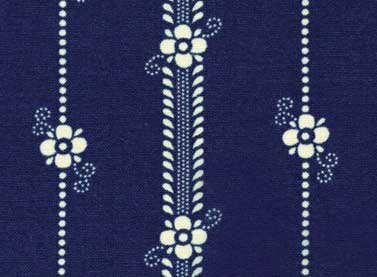 The narrow stripe is sized just right for sashing and borders on quilts, and collars, cuffs, and edge trims on apparel and accessories. The bandana prints look great paired with denim and striped ticking. Mix and match the Soho Bandana cottons with Amy's coordinating Crossroads Denims from James Thompson. Bandanas and denim make wonderful totes and sleeves to cover and protect laptops and notepads. Make a paisley shirt with a striped yoke to wear with jeans and a denim jacket. And, what black Lab wouldn't be proud to sport a red or green bandana on a trip to the dog park? Red Rooster's Soho Bandana collection by Amy Barickman of Indygo Junction features iconic bandana squares in red and green and seven carefree coordinates in red, green, and navy.